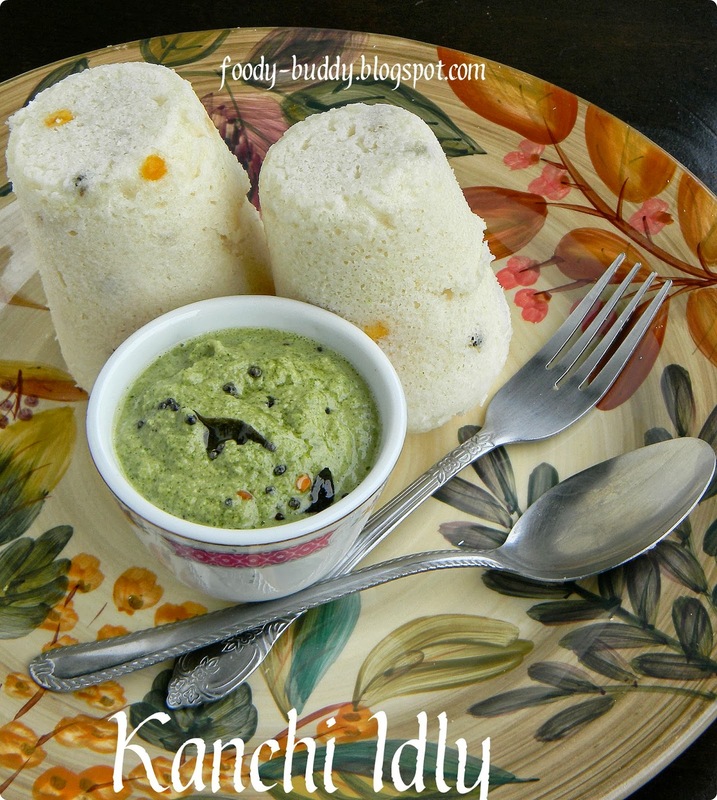 Vendhaya Idli Recipe / Fenugreek idli / Methi idly recipe is simple and easy to make south Indian breakfast dish. Some people might think that adding fenugreek would make idly tastes bitter…but that is not true, it makes the idly soft and tasty, you don’t taste the bitterness. 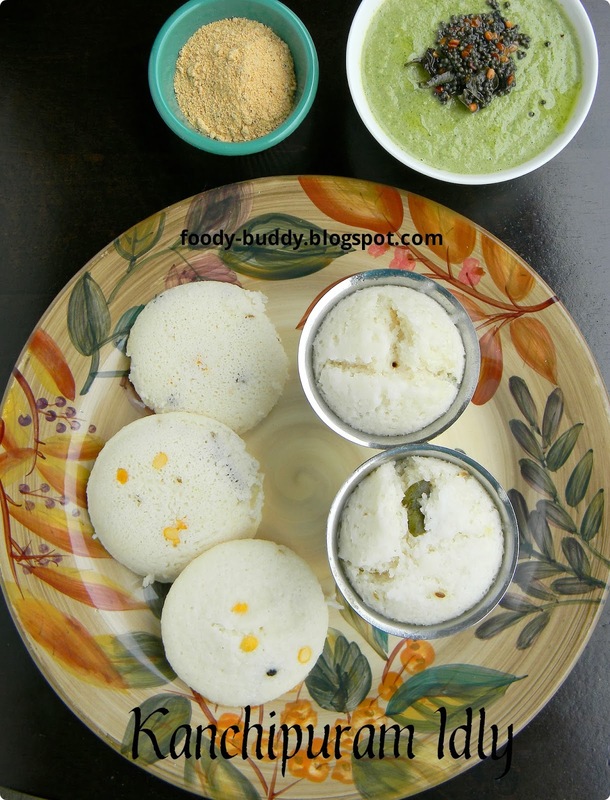 I got this recipe from my amma and this idly recipe is without urad dal, also diabetic friendly idly dish. 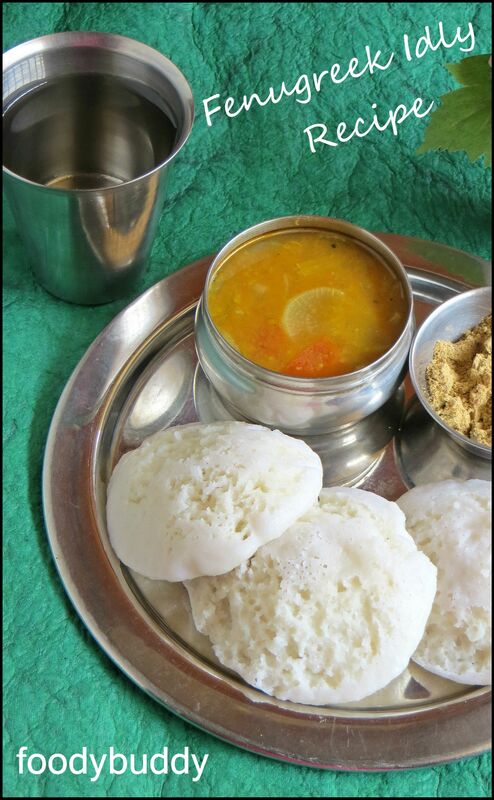 Those who are allergic to dal, can have this vendhaya idli for breakfast or dinner. 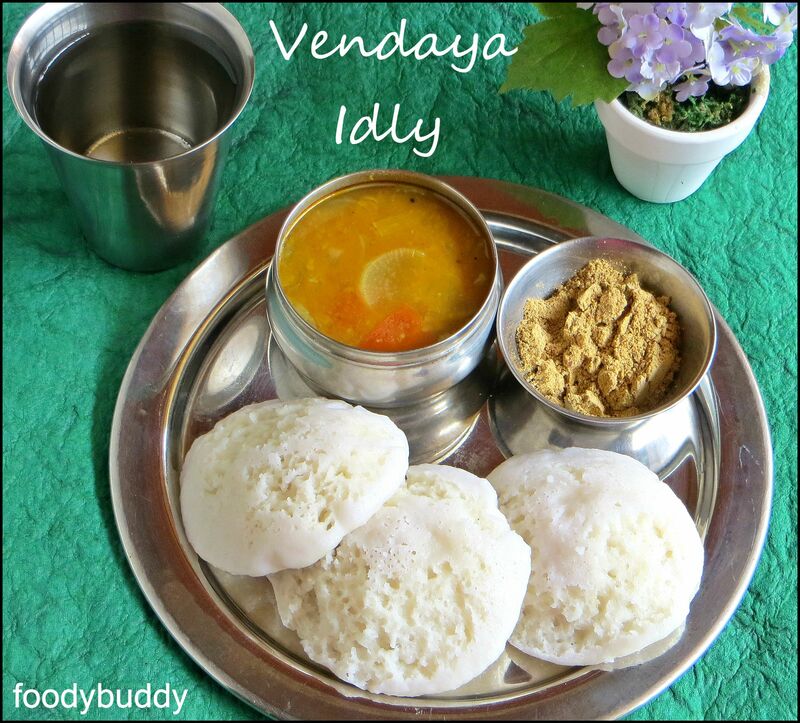 Best accompaniment for this vendayam idly are sambar, tomato chutney or idly podi. Making vendhaya idli once in a week, keeps our body cool, healthy and fresh. Soak the fenugreek in water for 4 hrs. Soak the idly rice in water for 2 hrs. In grinder, first grind the fenugreek and add water little by little. Grind the fenugreek until you get soft and fluffy batter. Make sure the fenugreek batter looks similar to urad dal batter. Remove and transfer it to a bowl. Grind the rice separately and transfer the batter to the same bowl. Mix both the batter with hand along with salt. Let it ferment for overnight. The next day, mix the batter with laddle before making idly. 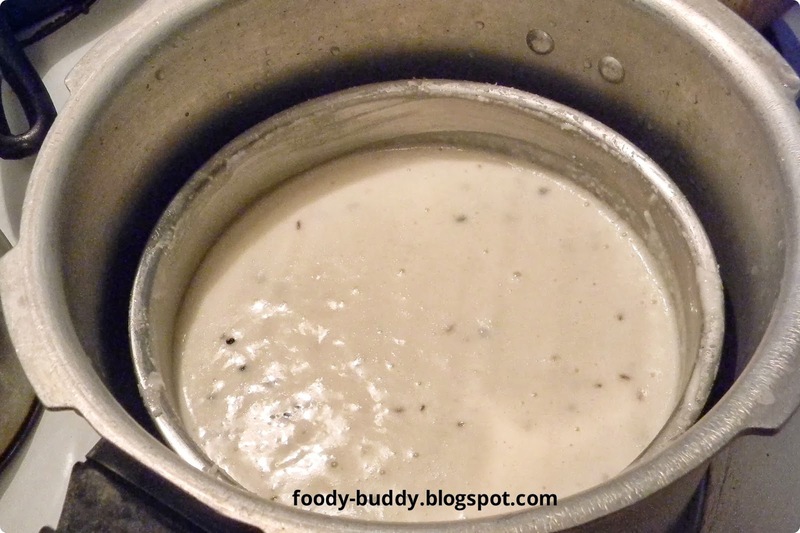 Pour the batter in idly plate and steam it for 10 mins. you can wet the hand and dip the index finger to check if it is cooked. If it is sticky, steam it for another 2 mins. Hot, soft fenugreek idly is ready to serve with coconut chutney or onion tomato chutney or peanut chutney. Always soak fenugreek and rice separately because the bitterness which gets imparted with rice makes idly bitter. Use your hand for mixing for better fermentation. For best result of batter, use wet grinder rather than mixie. 26.2 gram of protein in 100 grams of fenugreek. Cure arthritis, skin problems and improve digestion. Treat diabetes and lowers blood sugar level. Ease child birth for pregnant women. Aid milk production in lactating women. 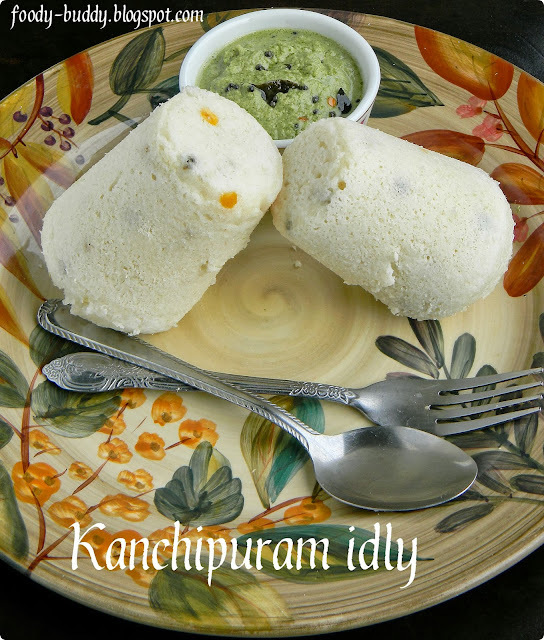 Idly is a soft rice cake and a popular south Indian comforting breakfast dish. 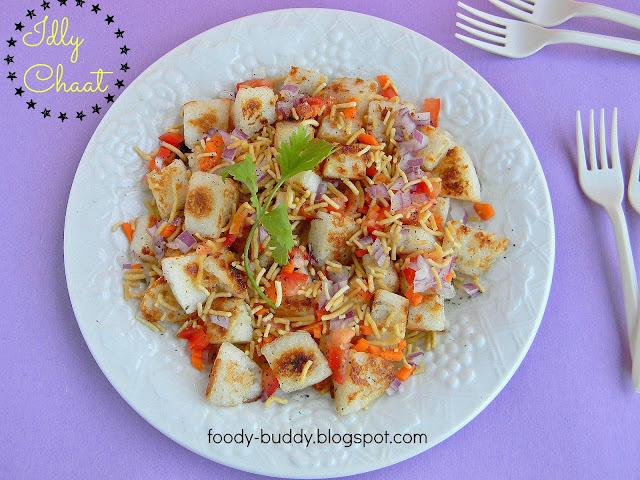 Chaat means savory snack. 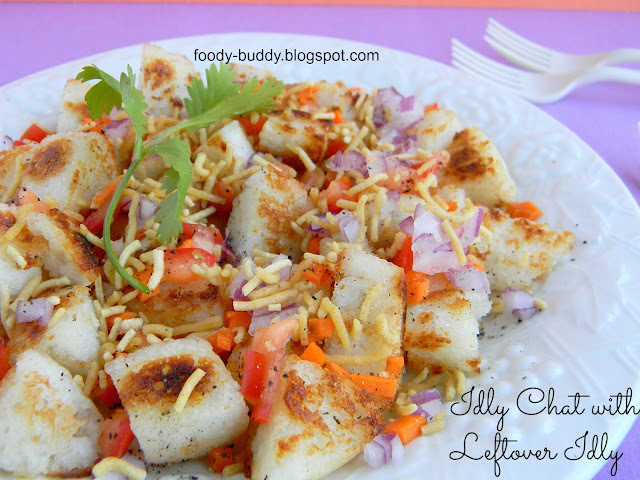 If you get bored of doing idly upma and podi idly with leftovers, then you should give a try with idly chaat. 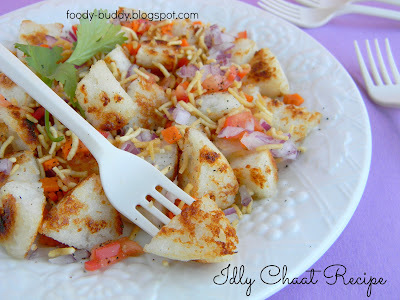 This idly chaat recipe is made with leftover idly. Seriously, they are so tasty, golden crispy on outside and soft bite on inside. I bet your kids will love this chat for sure. 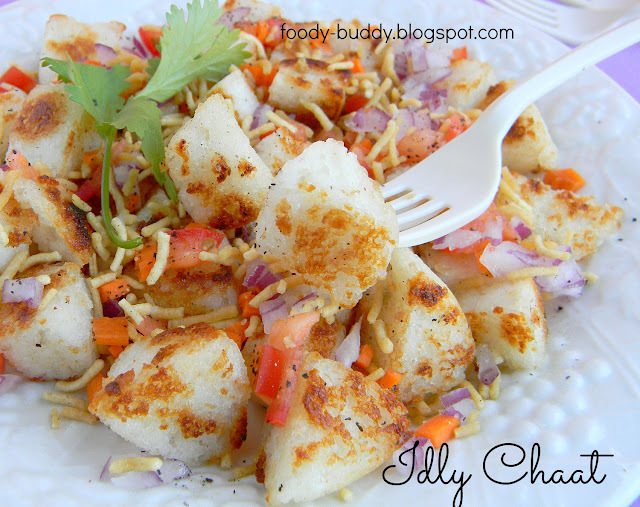 If you have leftover idly sitting on your fridge, then try this crispy idly chat..yum..yum.. and enjoy with hot cup of tea..
Heat oil and ghee in a non stick pan, swirl the pan so that it coats all the surface of the pan. In a medium heat, place diced idlies to the pan, wait until it turns golden brown. Flip the idly to the other side with spoon and wait till it turns golden brown on other side. Turn off the flame and transfer it to the serving bowl. Now sprinkle some chopped onion, tomato, carrot, black pepper and black salt. After that, add lemon juice and coriander leaves, gently give a quick stir. Add tomato ketchup before serving. 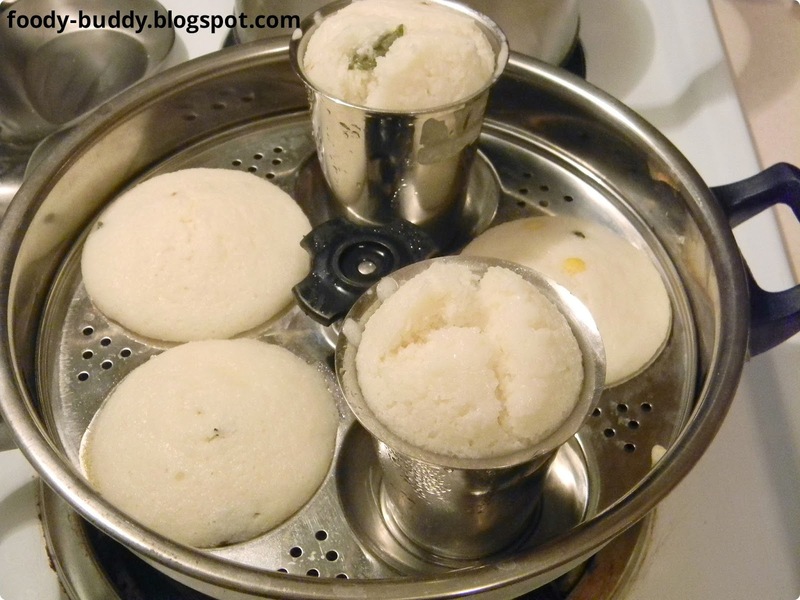 Always use leftover idly instead of fresh idly because they turn soggy. You can deep fry the idly instead of shallow frying. If you have leftover idly in fridge, then leave it outside for 1hr and then do the chat. You can grate the carrots instead of cutting them. Add tomato ketchup at the end, because it makes idly soggy and you cannot feel the crispy texture of idly. You can add kara boondhi instead of sev (Oma podi). You can use red chilly powder for spicy taste.